The Model K-400 offers reliable power that cleans tough everyday drain line blockages in tubs, showers and sinks. A sleek profile and user-friendly design get you up and running easily -- and on to the next job quickly. Ideal for drain cleaners, service plumbers, facility and institutional maintenance departments and property management companies. Not designed to remove root blockages. 3/8" (10 mm) cable best for 1 1/2" to 3" (40 mm to 75 mm) lines. 1/2" (12 mm) cable best for 3" to 4" (50 mm to 110 mm) lines. Integrated Transport Cart - Easy movement to and from the job site. Heavy-duty, large wheels easily navigate over bumps and up stairs. Retractable Handle - high-handle height during transport. Cable Control System - causes the drum to stop spinning when the blade becomes lodged in a blockage, limits potential for cable to flip-over in the drum and helps to indicate to operator when blockages are encountered. "Solid Core” Cable - uses tough 3⁄8" (10 mm) or 1⁄2" (12 mm) Integral Wound (IW) solid core cable that is rugged and kink resistant. 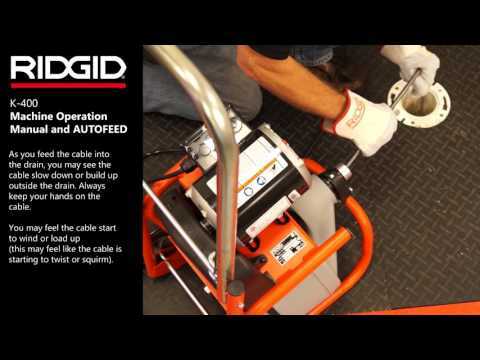 AUTOFEED® Control - offered as an accessory, this patented, automatic cable feed powers cable in and out of the drain. Reverse the direction of the AUTOFEED and the cable feeds back into the drum. Drum Capacity 100' (30,5 m) of 3⁄8" (10 mm) diameter cable or 75' (22,5 m) of 1⁄2" (12 mm) diameter cable. Motor 380 watt, motor spins cable at 165 RPM. Weight (Machine Only) 45 lbs. (20.4 kg). Dimensions Length 21" (53 cm) 24" (61 cm) with AUTOFEED, Height 23" (58,5 cm) Width 17" (43.2 cm). 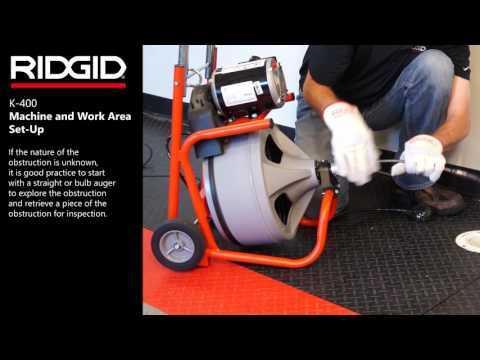 All Model K-400 machines are supplied with RIDGID® drain cleaning gloves and operator’s manual. K-400 Drum Machine is rated 4.5 out of 5 by 232. Rated 4 out of 5 by lukejhwang from Overall Good, but Welded Cable End broke after Several Attempt... My family owned a quite large size of Laundromat carrying 200 + of wash & dryer machines. While working on several of hard-cloaked commercial drains, the edge of cable end broke twice. (Another one borrowed from family friend's business. Fortunately, Ridgid sell the Repair Kit, so I bought them. By the way, the machine worked well over all, but Ridgid need to work more on the cable end. That is why I only rated Durability as "Average." 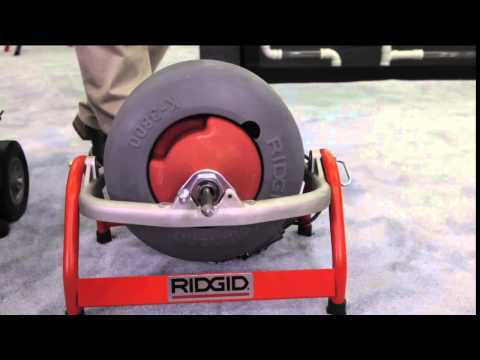 Rated 5 out of 5 by PoopersClogged from Saddled Sewer Line: compact, lightweight & easy to use. :) We have a dip in our sewer line about 30 feet from the house that slowly plugs up so being fed up with the mess and hassel of getting a professional in I grabbed this unit from a local store. Watched a couple of YouTube videos and tried it out. Very easy to use and a whole lot better than stopping and adding extra cable (professional has an ancient machine). Weight is very manageable and the unit is nice and compact so it does not take up much room. Two uses will pay for this machine and it is available to me 24/7, which is nice because the sewer usually plugged up on the weekends and I hate waiting for help (no toilet, shower or laundry use available). Rated 5 out of 5 by ironclubbah from Landlord with flooding basement Great product light weight easy to use and very safe. Rated 5 out of 5 by John2 from Worked great Only used two time, a lot better than rental machines that are all beat up. Rated 5 out of 5 by Willibill from 50% PAID FOR WITH FIRST USE!! As an add-on, our new kitchen is further away from the main drain system than the previous kitchen. The longer distance translated into less drain pipe slope than optimal. It's been, therefore, necessary to invite a plumber to our house about every six months to clear the drain. Although the plumber responded quickly and was effective, each visit cost about $250. Therefore, the economics of buying a RIDGID K-400 were obvious. Rated 5 out of 5 by Ramon50 from This product has good reviews I purchased the unit because of the good review to have it in case I need to clean out the sewer lines. So I have it- and I hope when the time comes it willserve me well. I THINK IT WILL. i WAS ABLE TO CLEAR OUT A BLOCK OF ICE, A TREE ROOT SHOULD BE EASIER. replace 3/8&quot; cable with 5/8&quot; cable? I have a Ridgid K-400 drum machine. Will a 5/8&quot; cable work with the K-400 machine? Also, is there a replacement cutter head available for the Ridgid 3/8&quot; cable? i have a older k 400 machine. can i add a autofeeder to it? where can i buy one? Auto feeder is very slow. Don't buy! HI, HOW DO I REPLACE THE CABLE ON MY DRUM AUGER? Easy, just don't tangle it. Go to a large area and pull the cable out, then you will run into a clip that retains the cable at the very end. Use a flat head to loosen the screws in the back of the drum and the cable comes out.